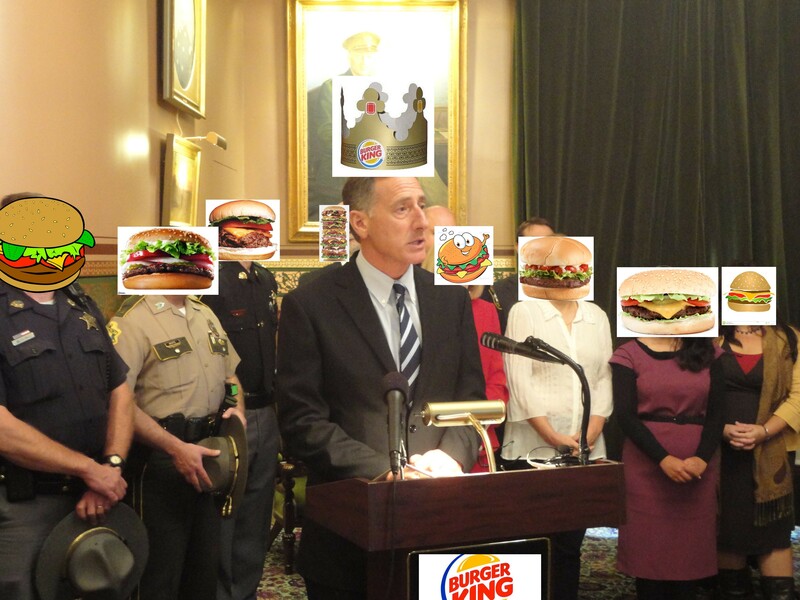 Health / Media / News / Video / Whimsy In Health Exchange Roll-Out, Shumlin Distinguishes Between "Nothing-Burgers" and "Something-Burgers"
"I was amazed that we could make a headline out of that fact, to be honest with you," Shumlin said at the time. "The fact of the matter is, that's a nothing-burger." On Thursday, he was asked whether he would characterize the system's more recent problems as nothing-burgers, too. "Let me be clear," Shumlin began his grade-A answer. "Let me be clear, because listen: I love you all in the press. I love you." "But sometimes you take a statement and I read it back and I go, 'Were they at the press conference?'" the governor continued. "I was asked by a reporter whether the delay — very specifically — whether the delay on the electronic payment system in October was a big deal. What did it mean to Vermont? I said, listen, I said that particular detail is a nothing-burger." And then he really got cookin'. "So let's talk about nothing-burgers and something-burgers. The website is a something-burger," Shumlin clarified. "The challenges that we're having with the website obviously are something-burgers. The nothing-burger was what I responded to at the last press conference I had before I went to China, which was the delay of payments on October 1st when no one is going to be paying on October 1st, because no one's getting an invoice yet. Now, I've never heard of a business who pays a bill when they don't have an invoice." Relishing the opportunity to bite on the metaphor, Associated Press reporter Dave Gram grilled Shumlin further. "Governor, what kind of condiments go on a something-burger?" he asked, steak-ing out new journalistic terrain. "Lots of investment in technology from all over the country coming together to try to coordinate different websites would be the condiments in this something-burger," Shumlin said, playing ketchup to Gram's well-done line of inquiry. "Because I gather no condiments go on a nothing-burger," Gram said. "You got it," Shumlin said with rare brevity.